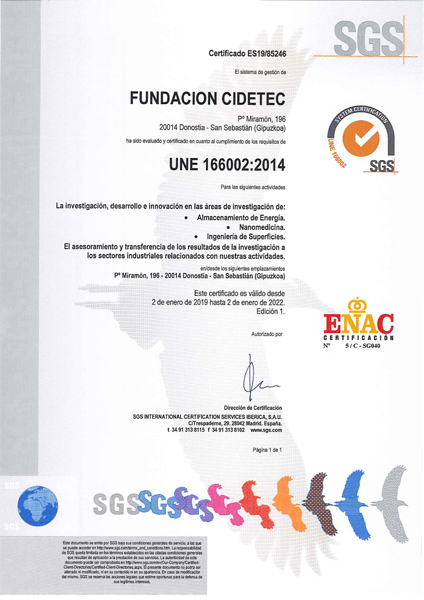 Cidetec has been certified for UNE 166002:2014, which validates the adaptation of the centre’s R+D+i management system to the applicable requirements of the reference standard. The centre approached the implementation of this management model in a record time of less than a year while adapting to the 2015 version of ISO 9001, which recertified CIDETEC compliance with the requirements of quality management systems. To achieve this, the organization has had to pass two audit phases conducted in October and November last year by a team of auditors from SGS, who checked the centre’s R+D+i management system compliance with the requirements mentioned. This has entailed a restructuring of the internal processes and procedures defined in the centre to achieve an integrated management system oriented to excellence and continued improvement.